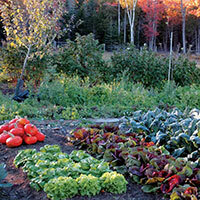 Many folks wonder where to begin when starting vegetable gardens. 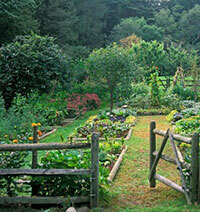 Vegetable gardens are not only easy and fun, but the fruits of your labor are quite rewarding. There are a lot of variables and considerations that need to be taken into account when growing vegetables, so that’s where this article comes in. The process explained below is by no means the only way to begin, but hopefully it will get you started on the right foot. Choosing Your Crop: One of the initial mistakes many folks make also turns out to be their biggest. When starting a vegetable garden, I’m a big of fan of keeping it simple. Take a moment to think it through and figure out what vegetables are you really looking to get out of your garden. It’s very easy to go into a project like this with grand ideas and big intentions, but the bigger the plan, the greater the amount of work that goes into it. Don’t bite off more than you can chew, especially if this is your first shot at starting a vegetable garden. Stick with the crops you enjoy the most, and will get the most use out of. As you get a routine year after year, you can always expand your growing in subsequent years. Determine Your Growing Space: The amount of space you choose to use for starting a vegetable garden is really dependent on what type of vegetables you decide to grow, and how many. In the first step you will also want to research the sizes of the mature vegetable plants so you can adequately plan your space requirements. Once you have chosen the site, and the size of the garden, till the soil over so it is not hard and compacted, and to break up any weeds and grass that might be growing. Solarizing the Soil: If you are preparing your site in the fall for a vegetable garden next year, you have the advantage of being able to solarize the soil to kill off any weeds and bacteria that may exist in the soil. The process is very simple. Find a thick clear plastic tarp that will cover the entire tilled area. Thoroughly wet the soil across the entire area, and then immediately cover with the plastic. Use bricks, stones, or old lumber to hold the plastic down at the edges, and prevent air pockets in the middle. 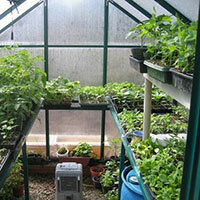 This will allow sunlight in to heat the soil, but will trap the heat underneath the plastic. This process will cause the soil temperature to rise well in excess above lethal levels for most weeds, bugs, and bacteria. The heat is the key. Starting vegetable gardens this way gives you a much better starting point and it will save you a lot of work in the long run, fighting the weeds later on. Check the pH Level: Before you begin starting a vegetable garden, you will need to first check the pH level of the soil. You can go to any nursery or garden center and pick up simple test kits to test your soil. The kits will have easy to follow instructions that you can quickly determine if your soil needs any adjustments with lime or sulfur. You want an ideal pH level of as close to 6.5 as you can get. This is widely considered the optimum pH level for starting vegetable gardens. 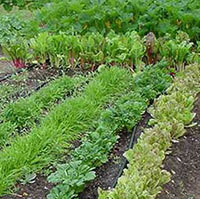 Till in Organic Compost: By this step you should have an excellent starting point for your vegetable garden. The soil should be clear of all weeds and grass and almost ready for planting…almost! You may have cleared out the riff raff, but now you have to condition the soil to give your veges the best possible chance. We are going to condition the soil by adding compost, or other organic matter to add nutrients to the soil. You are going to want to do this step in the spring time just before planting, because organic matter will break down over time. If you don’t have the luxury of making your own compost, there are plenty of places to purchase truckloads of the stuff cheap. If you are doing a small vegetable garden, you can probably even get away with buying bags from your local garden center or big box store. Either way, lay down about 3 inches of nice, rich compost soil on top of your site. Then till the freshly laid compost in with the existing soil. If you discovered from the pH test that you will need to add adjustments to the soil to balance the level, this is the time to do it. 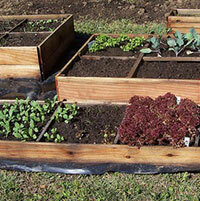 Lay Out Your Rows: The next step in starting a vegetable garden is to lay out your rows. You can do either narrow rows or wide ones. Wide rows tend to be easier to work with and they offer a few added benefits. The plants will spread out covering more soil and yielding more crop, and they also will create their own living mulch that helps to crowd out the weeds. However you lay out your garden is up to you however, you are the one that has to work it. You can use wooden stakes and string to assist in laying out your rows initially, this will give you the chance to step back and look at the bigger picture before you actually put any seeds in the ground. If you don’t like the layout here, fix it now! You won’t get another chance later on. Make sure to leave yourself a walkway if you are going to plant a large area. The last step in preparing the ground for starting vegetable gardens is to lay out a light amount of fertilizer over the planting areas only! Here you will be looking for a granular 5-5-5 fertilizer and then lightly rake it in so that your seeds are not touching the granules. Plant! : If you have followed all these steps, you should have a nice plot for starting vegetable gardens. All you need to do now is sow your favorite seeds and you’re off to a great start!